1. Start with a green. Spinach and kale are our favorites, although kale definitely has a stronger taste to match its extra calcium. 2. Add bananas. I regularly peel and freeze 4-5 bananas in bunches specifically for smoothies because they make a great base in lieu of dairy or milk. 3. Choose another fruit for your smoothie, which will most likely be the dominant flavor. Berries — either individually or mixed — make a great addition. Pineapple is another one of our favorites. If your bananas are frozen, you don’t necessarily need frozen fruit; fresh fruit works just as well. 4. Add some orange juice or a large spoonful of frozen orange juice concentrate. We don’t drink a lot of juice, so I keep frozen OJ concentrate in the freezer just for our smoothies. Because you’re going to add a fair amount of liquid in order to blend all of the fruits/veggies together, you need the OJ to keep it from tasting watered down. 5. Pour a generous amount of water into the blender. It should submerge at least half your fruits/veggies to start, and you may need to add more as you blend. 6. For an extra boost, add a generous tablespoon of freshly ground flax seeds, a heaping tablespoon of coconut oil (more with pineapple for a delicious pina colada flavor), wheat germ, nuts & seeds. We mostly stick with flax seeds and coconut oil, but I’d imagine the options are pretty endless here! Blend until smooth, adding more water as necessary. Serve thicker smoothies in a bowl with a spoon or add water until it’s thin enough to drink through a straw. Pour extra smoothie into a popsicle mold for a healthy summer treat! This looks simple to do yet very Healthy looking. I think I’m going to try this later today. Thanks for the recipe. I’m a little late in this conversation, but I do want to correct the misperception that you need a Vitamix to crush ice. We have a Krups Xtreme Power blender, about 10 years old, and it crushes ice very well. I don’t remember what we paid, but I’m sure much less than a Vitamix. I LOVE smoothies! I have a vitamix and LOVE it! 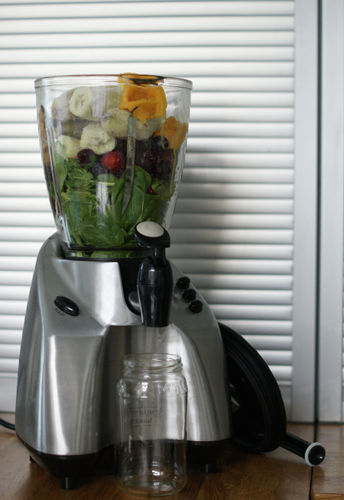 A regular cheapo blender won’t grind ice up fine like a vitamix will. I could only afford it because it was used and it has lasted over 10 years for me with lots of use and I bought it already old! My favorite way to make a smoothy with out milk is 1 cup froz berries, 1 1/2 cups juice (watered down) or tazo brand passion tea sweetened with stevia and cooled with 1/2 to one whole frozen banana. I add flax or greens or macha depending on what I have and if I am using dairy I add 1/2 cup or so plain yogurt. YUMMY My kids sometimes choose this over ice cream for a treat! Kristy from http://www.apronsandapples.blogspot.com my crafty healthy blog. Do you use a particular blender? I’ve seen the Vitamix blender and wondered about it with the EXTREMELY steep price tag. We frequently make green smoothies and we only have an Oster brand blender that we paid about $40 for. We have also made protein shakes and other types of blended smoothies and personally, I think it works just fine!